This year I decided that the eaves on my house needed some attention. They had bends, kinks, and cracks which just couldn’t be ignored any longer. I thought about hiring a contractor to take care of it, but then I thought what a wonderful opportunity to try out the DIY Vinyl Eavestrough I have been seeing around the hardware stores. It would be a fun project for me and &Family to tackle, and we may even save a few bucks. So, after a little research online, it was off to the hardware store. The instructions I had found made it sound pretty easy, all the pieces just lock together and hang from clips which get screwed into the fascia. We played around in the eaves section trying to figure out which of the vinyl pieces went with what. There are a few different systems, and a few different sizes. BE CAREFUL! We had to go back a couple days later, because different sized hangers had been mixed into the same box and we hadn’t noticed while counting them out. The first thing you’ll notice, is that the price of the eavestrough is really low. Then you’ll discover that each hanger is going to cost you $3-5 or more. And finally, the downspout attachments get up around $15. A little quick math and you’ll probably find that the contractor is starting to look good. We take our materials home and get ready to start the back of the house. I rip down the old eaves with extreme prejudice, and a little too much glee, then the kids get all the soffets and fascia cleaned up and repainted. My research told me that we wanted a drop of 1/8″ for every 10′ of eave, so we figured out our drop, marked each end of the house and ran a chalk line. We then had to screw all the hanger clips in place. The website said every 24″, but those clips are expensive so I was hoping to get away with every 30″. 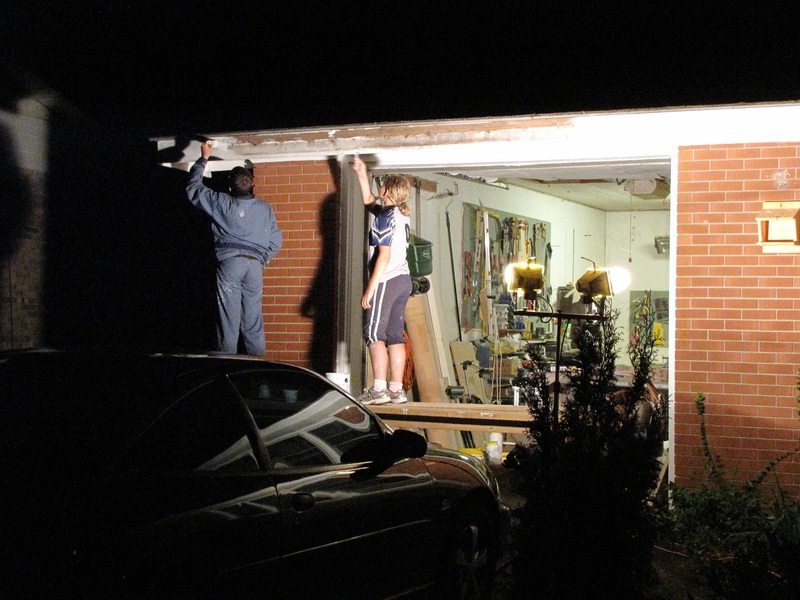 (This turned out to be a bad idea – on the front of the house I went back to 24″) As we put the hanger clips up, we were also assembling the eavestrough. End caps were installed, they just pop on, then the hangers were slid into place. The hangers must be slid onto the eavestrough from an open end. Then it was a simple matter to line the hangers up with the clips and snap it into place. The second piece of eavestrough connected to the first with a two-piece coupler. One piece outside, the other inside, and then lock together when you have the two eavestrough sections lined up. The coupler is pre-caulked and seems to form a good seal. At the downspout location we screwed the downspout adapter directly to the fascia and the eavestrough simply slid into one end of it. There are marks inside which are labeled with temperatures. You want to place it so that the end of the trough is lined up with the approximate temperature at that time. These placement marks allow for proper contraction/expansion of the vinyl as the seasons change. The downspout was pretty simple. Clips are screwed into the wall, and downpipe pieces are cut and attached with elbows to get the shape required. All-in-all it was a pretty easy system to work with. But there are problems which I didn’t discover until later. 1) Cost: This may be an affordable method if someone was putting eaves on a doghouse or shed, but for use on your house I would strongly advise hiring the contractor. It’ll actually end up cheaper in the end. 2) Lack of proper instructions: I didn’t see anything at the store, the staff were of no help (who really expects them to be? ), only a few little blog pages like this one to try and gleen info from. 3) Clip Spacing: This is critical – no more than 24″. Vinyl is very flexible, and when the trough fills up with water the wider gaps between the hangers allows the side to bow out and spill the water. In one instance it bowed enough to pop free of the clips. 4) Downspouts: The pieces are just held together by a screw, just like with metal downspouts. Be very aware of screw placement. It will catch every little leaf if it is in the wrong place. I suggest putting the screw on top of any slanted pieces. 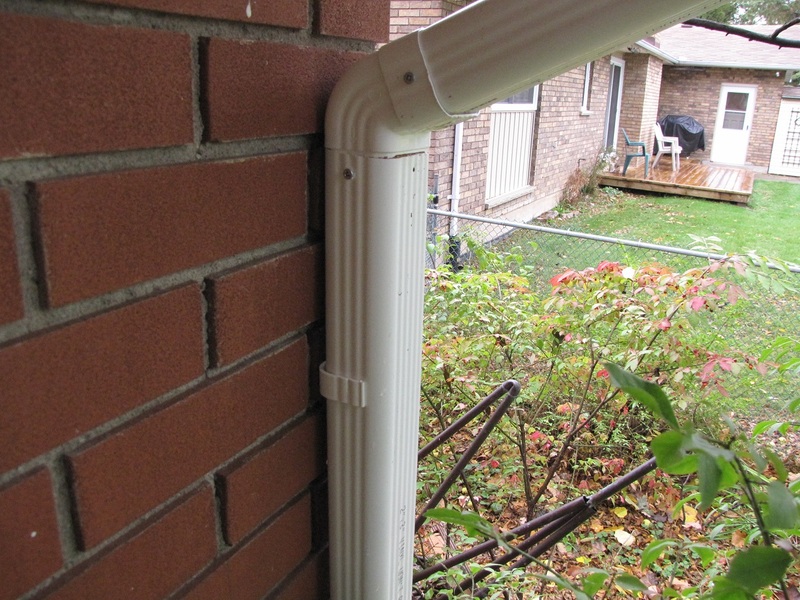 5) Downspout elbows: They have an arrow on them which point in to direction of water flow. Pay attention to them. 6) Clogging: They will clog on the smallest things. 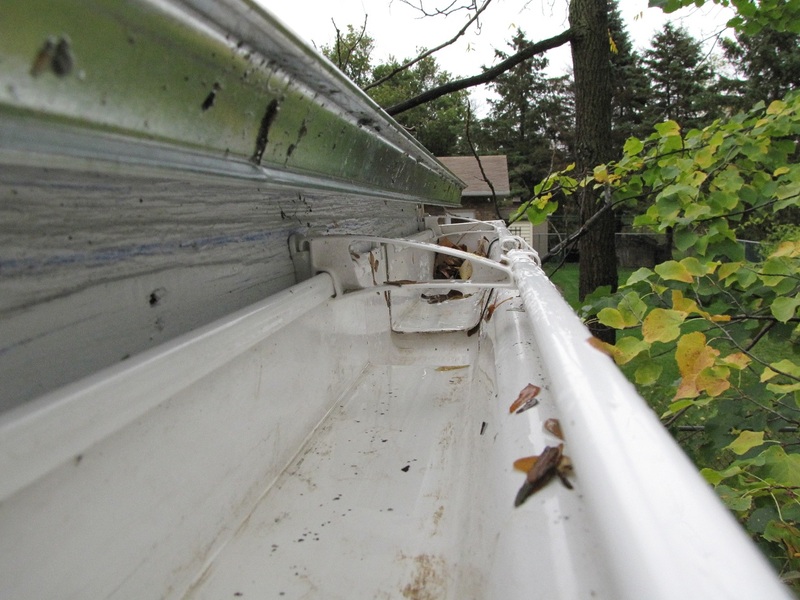 Definitely plan on using the gutter guards – which I should note, are very expensive and you’ll need a lot of them to actually cover your eaves. 7) Pitch: The angle they suggest is simply not steep enough. With 60′ across my house we dropped 3/4″ from end to end at the back of the house. Along with using too few hangers, we end up with water standing in the trough after a rain. I increased it slight for the front, up to 1″ drop, used enough clips, and the eavestrough completely drains. 8) Drip Edges: The original drip edge on your roof is probably set almost flush with the fascia. This is because metal eavestrough is nailed directly to the fascia leaving no gap between. The Vinyl Eavstrough has a clip and hanger behind the actual trough. 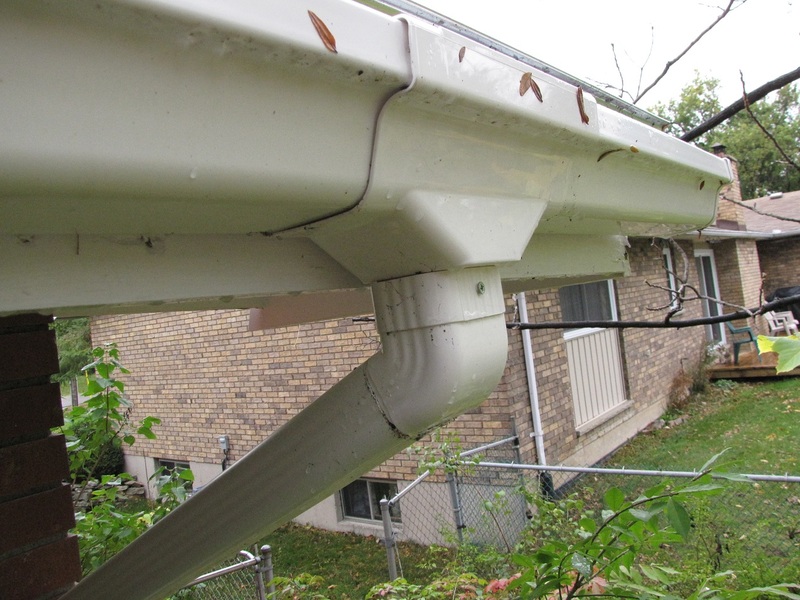 This means that there is a 3/4″ gap and when it rains the water will run off the drip edge and straight to the ground behind the eavestrough. To fix this I had to install a second drip edge about an inch further out on top of the first, while still making sure to be under the roofing tiles. Not an easy job, and even more cost. Overall Opinion: It is easy to work with. It performs the job I believe it was intended for. It should only be used for very small projects where hiring a contractor is just too expensive. 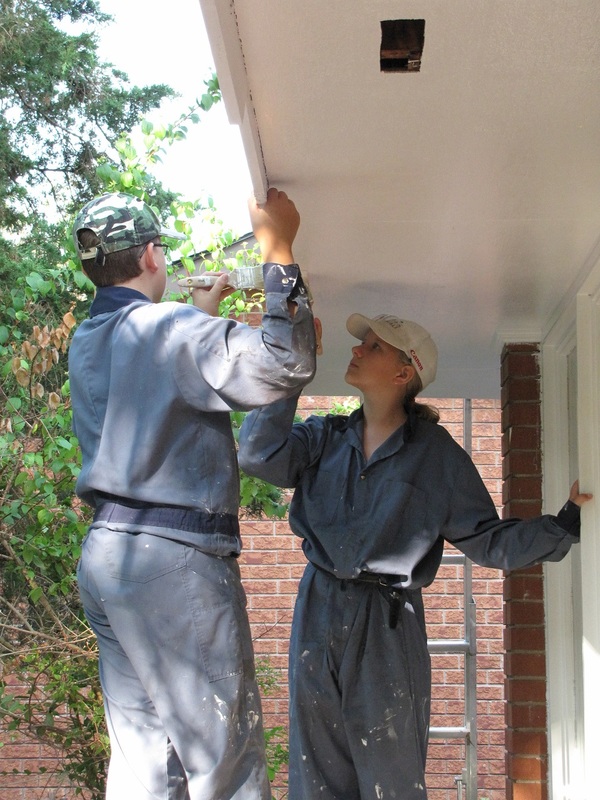 On bigger jobs, like your house, it is far cheaper, faster, easier, and longer lasting to hire the contractor and install metal eaves. So put it on your shed, it’s a great weekend project. Don’t put it on anything bigger unless you have a lot of money to burn. Update: We lived with the wide clip spacing on the back of the house long enough. During long slow rains there was little problem, but we don’t seem to get those anymore. Over the past year it has only seemed to rain heavily for shorter periods of time. This resulted in beautiful waterfalls pour down beside the house wherever the eaves decided to flex and spill. We couldn’t take it any more, so this past weekend we ripped the eaves down and added clips in between the existing ones. That means we now have clips every 18″. While it hasn’t been tested by torrential downpours yet, we can already see that the eave is straighter than before – much less sag. We are hoping for much better performance when mother nature decides to start soaking us again.